I’ve said it before and I’ll say it again…I am OBSESSED with Chinese food. Seriously, I can never get enough. But following the Weight Watchers plan, eating Chinese food on a regular basis can get me into some serious trouble! 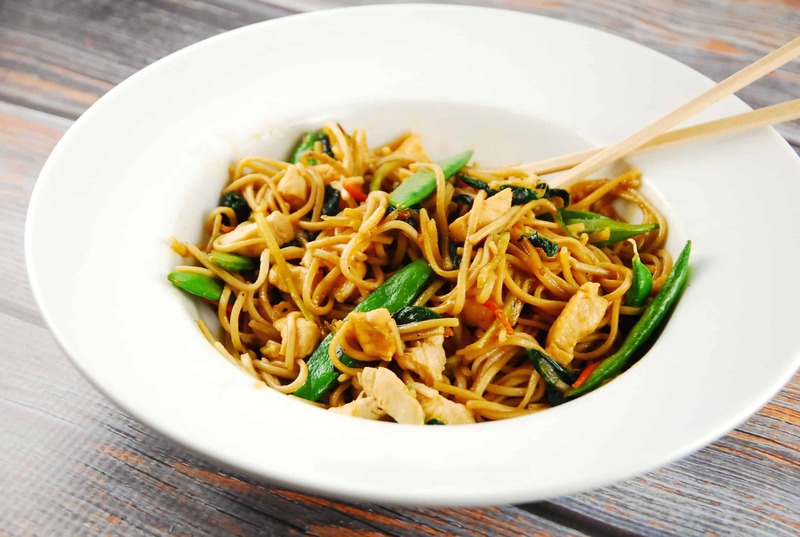 So I regularly attempt to create my own healthier and lighter versions, hence this incredibly delicious Chicken Lo Mein Recipe. It was AH-MAZING. Me, my husband, and both kids loved it. Plus, it was super quick and easy! When adding the veggies for this dish feel free to get creative…I used what I happened to have on hand in the fridge, but next time, I’ll add some mushrooms, bell peppers and maybe some bok choy. Also, if you don’t have access to or can’t find the broccoli slaw, you can use regular broccoli and shredded carrots. I just used the slaw form because my kids are more likely to eat vegetables if they aren’t easily visible. But if you need to get your Chinese food craving satisfied, this Easy Chicken Lo Mein is a WINNER at just 7 Smart Points per serving! Enjoy. This chicken lo mein is so easy and so delicious, you may never need Chinese takeout again! Healthy, versatile, and full of authentic flavor, it’s become a fast family favorite. Whisk together soy sauce, honey, rice vinegar, sesame oil, ginger and Sriracha sauce and set aside. Heat 1 tsp olive oil in a large, nonstick skillet over medium high heat. Cook chicken pieces until browned on both sides, and no longer pink in the middle, about 4-6 minutes. Remove chicken and set aside. Add remaining tsp olive oil, and add in broccoli slaw and garlic, and cook, stirring frequently, until tender, about 3-4 minutes. Stir in snow peas and spinach until the spinach has wilted, about 2-3 minutes. Stir in the lo mein noodles, chicken and soy sauce mixture, and toss gently to combine. Serve immediately. Made this last night and it was beyond awesome! We all loved this. Would appreciate points plus value for the older Gold Weight Watches. Where do you find Lo Mein egg noodles or what can be substituted?